Aptly named Precision MATCH, the programme combines cutting-edge technology with the unmatched expertise of Cogent’s specialist Evaluator Team. Through extensive assessment, the state-of-the-art system builds up a genetic blueprint of every cow and accurately selects the ideal sire to give optimum performance for the next generation. This ensures the whole herd is enhanced both physically and financially and provides a stress-free way to take every animal to the next level of genetic success. Precision MATCH Evaluator team (L-R) Michael Parkinson, Amy Hall-Brown, Phillip Arrell, Neil Greggor (kneeling), Kevin Rickard, James Sproule (kneeling). Unlike any other mating service, the innovative system is designed for British dairy farmers. 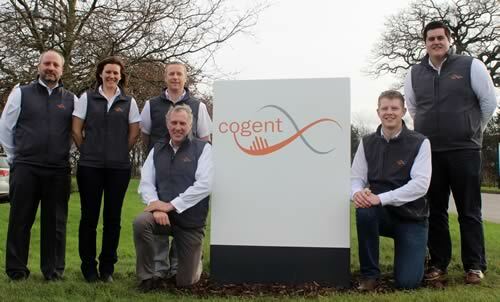 The cloud-based software, underpinned by Cogent’s extensive Precision umbrella, provides assessment and mating results using UK figures only; making it more accurate, relevant and unique for every herd in the country. Through rigorous technology and genetic science, Precision MATCH collates data for each member of the herd from maiden heifers right through to cows in third or fourth lactations. This significantly reduces the risk of inbreeding and provides a comprehensive picture of both individual cows and whole herd genetics. Farmers can then make an informed sire choice to satisfy personal requirements for production performance, conformation and profitability. Flexibility is the key word. The programme is based around the needs of each farmer rather than on set defaults. This allows the whole mating service to be tailor made for every user, regardless of pedigree status, breed or management system. “Precision MATCH is not simply computer dating for dairy cattle,” says Neil. “It is designed with UK data for UK farmers to, actively manage genetic recessives, minimise inbreeding and produce the best British cows. Using the latest advancement in science and technology, Precision MATCH takes the guesswork out of which sires to select and creates cows that are ultimately more profitable for you.